One of the things I cherish when I travel is the local food I find there. Many of you may do the same. This is one of the reasons we are increasingly seeking out homestays and smaller guest houses, preferring to give the regular hotels a miss. 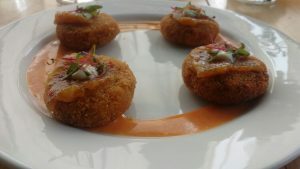 Chef Ritwik Sarkar did just that sometime back, when he travelled all over Kerala and Coorg. Which is why he is a man after my heart. During those trips, he learnt a lot of recipes from the regional cuisines and took copious notes. 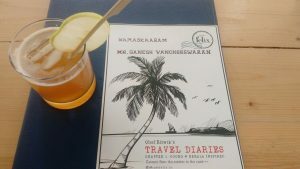 ‘Many Malayalis and Coorgis allowed me to enter their kitchens and learn how to cook their traditional dishes. That was a great feeling.’ says Ritwik. All those lessons have translated into a very interesting, limited-edition menu at Café Felix. 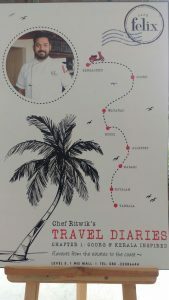 ‘Chef Ritwik’s Travel Diaries’ is a food pop-up being dished out until April 15. 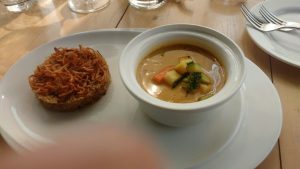 The pop-up menu has cocktails, soups, appetisers, entrees and desserts. Every offering on the menu draws its inspiration from Keralan and Coorgi cuisine, but has a global touch added to it. 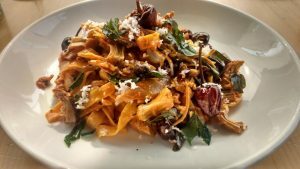 For instance, the chakka curry (jackfruit curry) is made Malabar-style, but tossed with homemade fettuccine and shitake mushrooms. What sounds like an unlikely combination is actually a delight when it lands on the palate. Inspite of adding a twist to every dish, Chef Ritwik has managed to keep the taste authentic and close to the native version. And that, to my mind, is his true triumph. 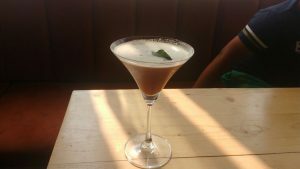 Southern Somras – dark rum, orange liqueur, curry leaves, jaggery, apple juice and tamarind water. Alleppey Apple – whiskey, apple juice, green apple juice, spiced maple syrup, Assam tea, fresh apple chunks, cloves and cinnamon. The effect of the spiced maple syrup is an utter delight. Jackfruit cutlets – I love jackfruit in any form, and totally loved these cutlets, which were fried just right and served with raw mango & jaggery chutney. Sweet potato & green pepper gnocchi – pumpkin erissery with baby spinach and picked radish. Chakka curry with homemade fettuccine – as described earlier. Vegetable ishtu – ‘Ishtu’ is how any Malayali worth his coconut oil pronounces ‘stew’. While it is usually had with appams, Ritwik servers it with a nutty pilaf. I didn’t realise how good this combination would taste until I spooned myself the first mouthful of ishtu and the rice. The caramelised onions add a nice crunch to the pilaf. Kerala Sundae – And towards the end of my meal, Ritwik delivers his knock-out punch. Three balls of vanilla ice cream arrive in a plate. I take a spoonful from each and realise that one has been stuffed with coconut, another with jaggery and the third, with banana. 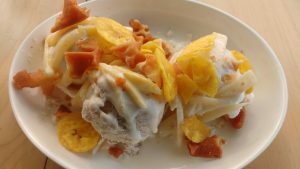 Bits of waffle, banana chips and strips of jackfruit complete this dessert bomb. The acronym ‘OMG’ is reserved for experiences like this one. 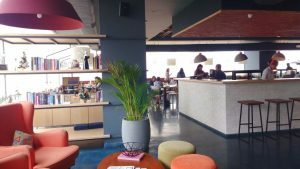 Now, quickly look at the photos below, call your foodie buddies or family and head over to Cafe Felix at 1 MG Mall. The pop-up is on only till April 15,2018. Show me some love. Like and share this post. Temple Tales – in Trujetter, September 2016 issue (please look under the section titled ‘Culture’). Soul-searching in Auroville – Scoot magazine, Aug-September issue, 2016. Click on this link and turn to Page 19 of the magazine to read the piece. Sign up for travel updates from me. ©2019 Eyes Wide Open· All Right Reserved.